Winter awakened from the chase dream gasping for breath. Her pulse skittered wildly. The unnerving nightmare took various forms but each version had two things in common—she was always on the run and she always knew that, sooner or later, the monster would find her. On some nights she ran through a dense forest, seeking a cave in which she could hide. In other variations she struggled to swim to safety through a gelatinous sea. Tonight, however, the dream took a new and disturbingly different dreamscape. She had found herself racing through a fiery maze, desperately searching for the way out but knowing all the while that she was only going deeper. Crap. She had adopted a dreamscape that had been constructed by a client. It was the first time that had ever happened. She had her own nightmares. She did not need to borrow Jack’s old, well-used dreamworld. Lightning crackled outside, strobe-lighting the night for a few seconds. The wind sang a song that sounded as if it came from another dimension. The storm had made landfall. That was probably what had awakened her. But for some reason that didn’t feel like the right explanation. She pushed the quilt aside and swung her legs over the edge of the bed. The room was cold. The comforting glow of the porch lights and the plug-in night-light had disappeared. That meant that the power had been knocked out. There was a battery-operated camp lantern in the kitchen cupboard. Arizona had given her instructions on how to use it. There was also a powerful flashlight in the kitchen drawer. But first she had to navigate the darkness of the bedroom and hallway. She fumbled for her cell phone. It was right where she had left it—on the end table. She gripped it and tapped the flashlight app. The narrow beam of bright light illuminated the path into the front part of the cottage. She slid her bare feet into her slippers and stood. She was surprised and more than a little annoyed to discover that she was still struggling to calm her breathing and her pulse. It’s just a storm. You enjoy storms. The energy is exciting. She focused on her breathing and told herself that there was no good reason to still be on the edge of panic. If your body is fighting your mind there will be a reason. There is always a reason. It may not be a good reason but it will, nevertheless, be a reason. Listen to your senses. She stopped focusing on her breathing technique and went through her senses one by one. She could not have seen anything because she had been asleep. Perhaps she had heard some small, unusual sound. She listened intently but the storm was still in full roar. The rain slammed against the windows. The wind shrieked and wailed. Underlying it all was the endless boom and crash of the surf at the foot of the bluffs. She went down the hall. She was crossing the living room area, heading for the small kitchen, when she heard the muffled groan and snap of metal and wood being wrenched apart. Shock flashed through her. She turned toward the front door just as it slammed open. Cold, wet wind howled into the cottage. A man loomed in the doorway, silhouetted against the glare of a lightning strike. The beam of a flashlight speared the darkness, sweeping the small space. She could just make out a long object in his other hand. There was a loud thud as the crowbar he had used to gain entrance hit the floor. Instinctively she looked to the side to avoid being temporarily blinded. She fumbled with the cell phone. It slipped from her fingers and clattered on the wooden floorboards. The narrow ray of light angled uselessly across them. There was no time to retreat to the bedroom and lock the door. Her only chance was to make a run for the kitchen door. But even as that realization hit she knew the odds of escaping into the night were nonexistent. The dining counter that marked the border between the living room and the kitchen was in the way. It might as well have been a brick wall. Lightning flashed again in the night. She watched in shock as the intruder yanked a long knife out of a sheath. Posted by arrangement with Berkley, a member of Penguin Group (USA) LLC, A Penguin Random House Company. 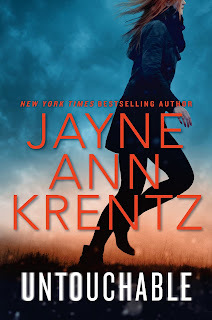 Copyright © Jayne Ann Krentz, 2019. Have any of you read UNTOUCHABLE yet? Thoughts? I've not read her lately but have enjoyed her in the past. Have not read it yet. As for the excerpt, what a hair-raising thing to face upon awakening. And I complain that I should not be disturbed until after my first cup of coffee. There would not be enough coffee in this lifetime to prep me or anyone for that kind of a day. But it sure makes for gripping reading. I'm reading this book now! So far, so good. Have not read this book yet. I have several of her books on my Kindle. I have been a fan for a very long time and this excerpt is a wonderful example of why. Thank you. Haven't read this one yet! Waiting on my copy from the library. I am a big fan of Jayne's and read them all. I haven't read it yet but I am on the waiting list at the library. No, I haven't read it yet, but I certainly will... be and soon. This book sounds too scary for me to even consider reading. I will just stick to my historical romances.